Kindred Cycles is a full service bicycle shop, born out of a love for bicycles and the people who ride them. 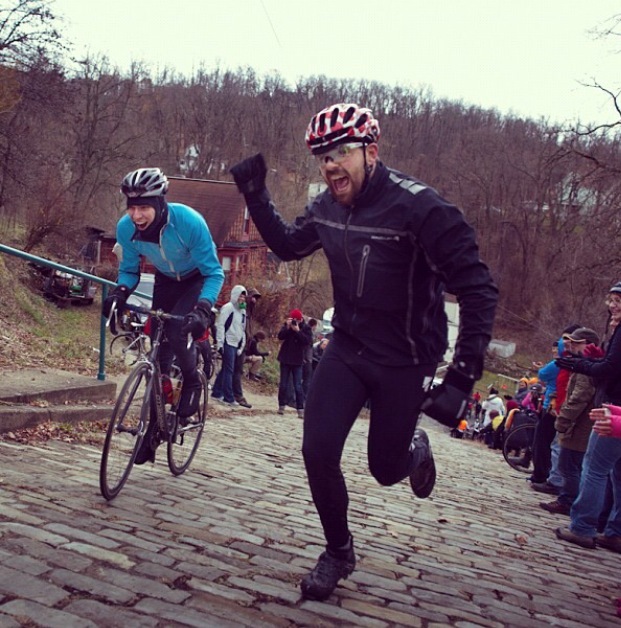 Pittsburgh’s strong community of cyclists is our family, and it’s our mission to support them. Although Kindred Cycles is just starting out, Katharine and Aaron both have spent their fair share of time in bike shops. 12 years ,filling positions all over the map. We both have always wanted something to call our own, but it wasn't till we shared our ambitions that we gained the necessary courage to try. Katharine Jordan was born and raised in Pittsburgh. In 2002 she moved to Boston, where she began cycling for joy and transportation, and wrenching out of curiosity and obsession. After graduating college Katharine worked as a full time mechanic in Boston and then in Savannah, GA. In 2012 she returned to Pittsburgh to find that over the past 10 years her hometown had been busy developing bicycle lanes, trails and a thriving bike community. Since returning Katharine has felt warmly welcomed by cyclists in Pittsburgh and looks forward to supporting current and future Pittsburgh cyclists at Kindred Cycles. Katharine loves adventures by bicycle, problem solving, kickstands, and cleaning chains. Aaron Stein is one of the founders of Kindred Cycles. Aaron moved to Pittsburgh in 2002 for a proper education and never left. Although the biology degree he came for has gained a good amount of dust, his bikes keep moving. Aaron rides any kind of two wheeled contraption he can get his hands on, whether it be mountain, cross, road, hybrid, etc... That said, Aaron is a bike commuter at heart and really wants to facilitate people riding their bikes all over Pittsburgh. He believes the best way to see Pittsburgh is by bike. Sarah Sanders started at Kindred in May 2016. She's from southwestern PA but spent a good chunk of time in Philadelphia, selling bikes and enjoying the flat topography. Sarah's been a bike commuter for nearly 10 years, and loves to see people equipped and confident on two wheels. She did her first bike tour in 2010 from Rochester, NY to Conway, NH on a Fuji Touring bike which she continues to love to this day. After moving to Pittsburgh in 2013, and building up some climbing strength, Sarah is really pleased to get to know our Appalachian cycling community. Nathaniel Holobar was born, we think, in State College and moved here to Pittsburgh in the fall of 2015 (at least that's what he told us). He has yet to write his own short bio so we are writing it for him. He is a pretty excellent mechanic and even better retro grouch. You can most likely find him cruising around town on a mid 80's road bike with a bunch of canvas bags gear tied to his bike or behind the service counter at Kindred working on bikes or reading the gospel of Saint Sheldon Brown or Grant Petersen.